A few days before the harvest on the most important plot of the Marbil estate, where the grapes used for the prestigious VVV vintage are grown, the oenologist heading up the production, Esperanza Moreno, is found dead in her house, with her throat cut and a pool of blood on the floor. It appears to be a crime of passion because she is several weeks pregnant. 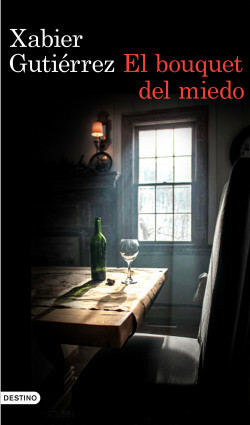 Now a deputy inspector in the San Sebastián police force, Vicente Parra will take charge of the case, which grows more complicated with the mysterious disappearance of Esperanza’s boyfriend Roberto and some apparent connections with the secrets of the Sáenz family, the owners of the estate. This is the beginning of the new novel by Xabier Gutiérrez, who has managed to reinvent the noire genre, mixing it with a world he knows like the back of his hand: that of gastronomy. The inventor of culinary noire fiction, Xabier Gutiérrez, returns to thrill us with a new crime to be solved in the vineyards of Rioja. Xabier Gutiérrez is a classic crime novelist, following in the footsteps of Agatha Christie, but he was the first to add an extra element to it: the fascinating world of gastronomy. On this occasion he focuses on the aromas and processes of wine production. The story is set in San Sebastian and La Rioja, combining two proud traditions of cuisine and wine, worlds that go together very well, and the author has managed to include plenty of recipes, flavours, tastes and aromas. A story with a lot of character, an intimate tone and an eye for the everyday details of the people involved. A very entertaining story in the wonderful setting of the vineyards of La Rioja and extremely attractive subjects: gastronomy and the world of wine.